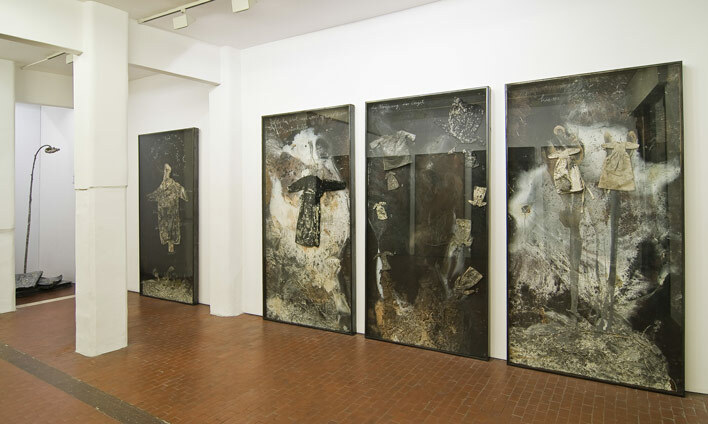 On Friday 14 May 2010, Anselm Kiefer opens his second solo show with Galleria Lorcan O’Neill Roma. New, tall paintings are on display in the main gallery, and a sculpture accompanied by works on paper are installed in the gallery’s annex space. Kiefer takes inspiration from sources ranging from Teutonic history, Norse mythology, and Judeo-Christian dogma to alchemy, cosmogony, and stellar astronomy. By using symbols and references from poetry and literature, he invokes humanity’s historical and spiritual past. In these new pieces, Kiefer works with palm fronds, ferns, dresses, ceramic ladders, golden seeds, and shards of glass on surfaces that resemble landscapes of the earth’s early years. Blackened and brittle, or gilded and growing, these plants are presented at various stages of their cycles of life, death and re-birth. Small linen dresses float amongst the paint and foliage, bringing a human presence to these terrestrial environments. Textures replicating ash and ruptured earth evoke the geological dynamism of a primordial planetary surface. Themes of mortality, contrasted with humanity’s epic search for the secret of eternal life, are also important in Kiefer’s work. The tragic Greek mythological figure Leander and the Babylonian hero Gilgamesh figure prominently in Kiefer’s newest works on paper. Leander, who loses his life while swimming to meet his lover across the sea, stands in contrast to Gilgamesh, whose distressed reaction to his companion’s death takes the form of a quest for immortality. Anselm Kiefer has made a new sculpture for the gallery’s annex space at the corner of via della Lungara. A celestial orb rests on the shoulders of the life-size sculptural figure, a new character in Kiefer’s group of “Women of Antiquity”. The orb, made of iron, contains gold and silver spheres that represent the sun and moon in orbit around planet Earth. Kiefer’s interest in women from ancient times highlights the remarkable strength, passion, power and dedication that females have brought to the realms of human knowledge, science and history. Galleria Lorcan O’Neill Roma has published a book of Anselm Kiefer’s works on paper on the occasion of the artist’s exhibition in Rome. The full-color book reproduces 33 gouaches that touch on all of the main themes in Anselm Kiefer’s work, and is accompanied by a rare text written by the artist.